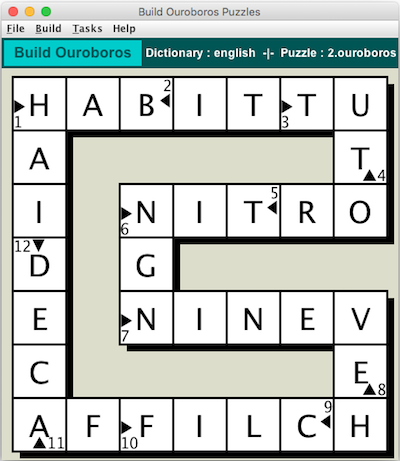 The following graphics show an Ouroboros puzzle in the Crossword Express Build screen and a PNG graphic file produced by the program's print function, showing the complete puzzle. 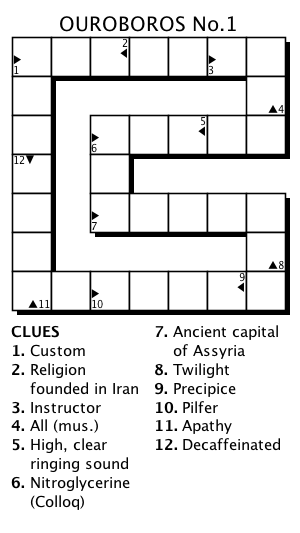 See also a full size version of a PDF file showing the puzzle. Fully automated construction of puzzles using the contents of a pre-selected dictionary containing both words and clues. Puzzles can be printed in an unprecedented range of user controlled formats. Output can be sent direct to the printer or, if you install the appropriate software, it can be sent to a PDF file. The recommended software for this purpose is Primo PDF which you can download free from their website, although you might consider sending them a small donation if you find their program useful. Mac users will be able to create a PDF file directly from the screen provided by the printer driver. A fully interactive Solve function is not yet available but may possibly be added in the future if enough people request it. A Review feature allows you to quickly scan through all of the clues in a puzzle. As you do, you will be able to add any clues which may be missing, or to edit any which you might like to change.